Sustainable enterprise is not a luxury but a necessity today and this book shows how sustainability within a company can be implemented. But there are very few books which explain how it can be done systematically? 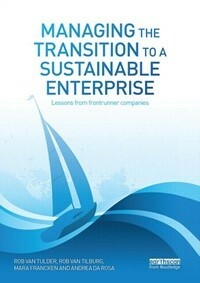 Starting with the explanation of the notion of a sustainable enterprise, the book emphasizes that an enterprise embracing sustainability assumes its responsibility towards people, planet and profit and tries to answer such questions like what the company is doing and what it should do and finally what it can do? Therefore, the book addresses a very practical and most challenging task in 21st Century of implementing sustainability concepts in an enterprise. The authors of the book present scientific analyses and qualitative and quantitative research involving 20 leading companies of the Netherlands, which have found their own pathway to adopt sustainability concepts in practice. Since stakeholders are the ears and eyes of a society, a company must accord the expectations of stakeholders a place of importance in formulating the sustainability management and pathway to a sustainable enterprise. The analysis conducted is based on the surveys of employees' responses and interviews with the members of board of directors of these companies. In the initial chapters besides providing the state-of-the-art research, the book addresses a business case for good sustainability policies can contribute to company's financial performance and its continuity and standing. The path to sustainable enterprise is a trajectory and the companies go through distinct phases characterized by company's attitude towards sustainability. Management embarking on sustainability initiative should first assess the phase the company is in and may decide which initiatives will help accelerate the process, keeping stakeholders in the loop. Of course the initial initiatives can be to improve the efficiency or freedom to do business, with environmental managements systems, improved trade flexibility with licenses covering essential operations or energy saving projects, etc. In short, the book would help a sustainability student and a manager to study various problems of treading the pathway to sustainability more scientifically, while presenting the relevant business models and associated transitional problems with ample illustrations.